BE a HERO to a CHILD. HERO UP! ATTACK of the EAR-WORM! 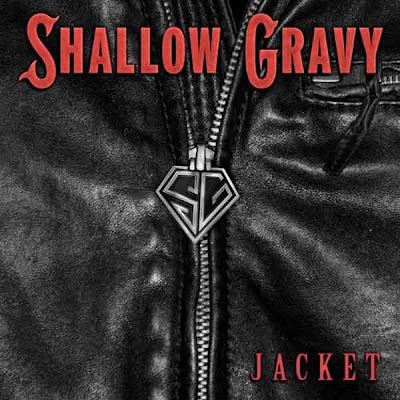 SHALLOW GRAVY - JACKET! 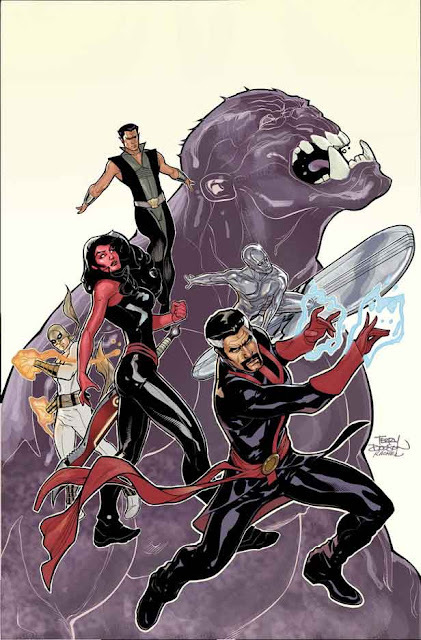 As seen here in a cover by Terry Dodson, Strange has donned scarlet gauntlets and a new red and black color scheme for his costume. Eager to see any new renderings of this new sorcerer's garb, I was intrigued by the appearance of a gauntleted Stephen Strange in NEW AVENGERS v2 ANNUAL # 1. 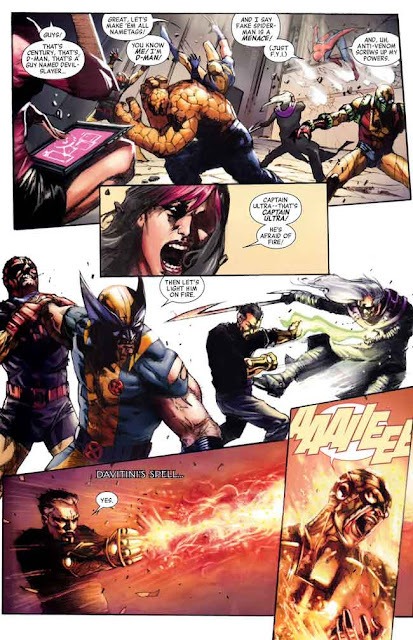 From NEW AVENGERS ANNUAL v2 # 1, as drawn by Gabrielle Dell’Otto, Strange has incorporated some kind of gauntlets into his apparel. Are they some kind of power-enhanced mystical items? 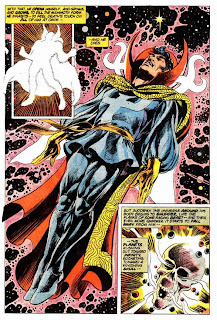 Something to help counter-act the damage to Doctor Strange's hands (something with which only Brian Bendis continually hinders the character.)? Or perhaps just some sweet bling for Strange to use to look awesome? Whatever their usage, these gauntlets look similar to a never-used-but-for-covers-and-a-cool-promo-image costume also designed by Gabrielle Dell’Otto. If only Dell'Otto was able to incorporate more of this fabulous design into the new look. 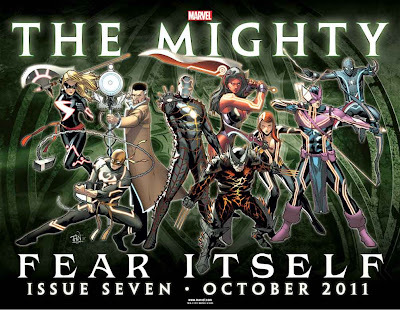 But now, there are two new previews from Marvel's December 2011 solicitations that show Doctor Strange's new uniform complete. The first, by Leniel Yu, is the cover to DEFENDERS : STRANGE HEROES # 1, a Marvel Handbook style biography volume that details the whereabouts of most of the major players in the Defenders' history. 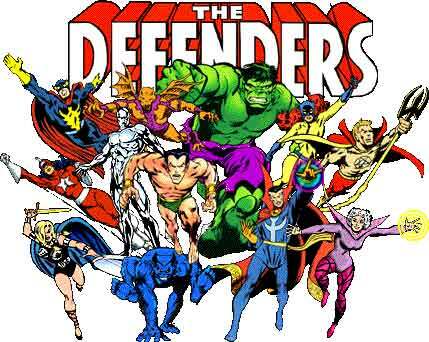 And the second, a new variant for DEFENDERS # 1 by Terry Dodson. 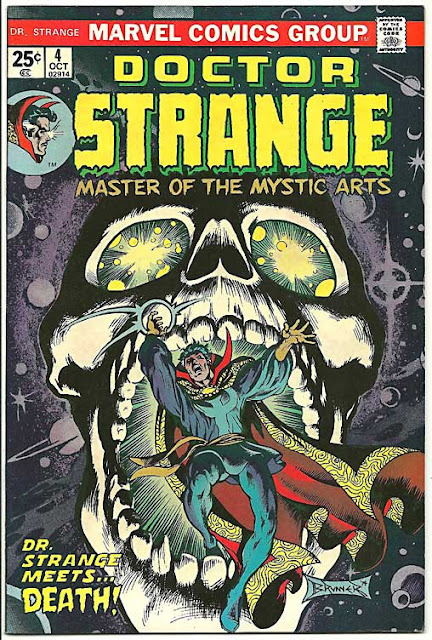 Personally, while I LOVE Doctor Strange's classic garb, designed by Steve Ditko, and seen in over 40 years of appearances, he hasn't worn it in the past few years. 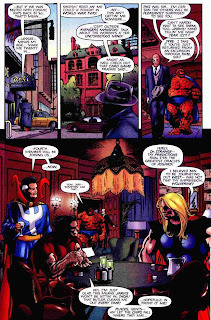 Instead, after losing the mantle of Sorcerer Supreme he has been seen wearing plain clothes of a brown trench coat and a black turtleneck sweater, with either black slacks or khakis. But now, since he is to be a headliner in at least one new title (DEFENDERS) while also putting in double duty as an AVENGER, and with a motion picture being hammered out, it would seem that Marvel is ready to put some flash into their Master of the Mystic Arts. If clothes make the man, then what do these new duds make of Doctor Strange? As I've been feeling under the weather (waaaay under) as of late, I am reminded of the apparent agelessness and eternal nature of our favorite characters. I'm not referring to the eternal nature of how some characters survive for generations as trademarks and corporate mascots, or survive within the memories of a societies collective consciousness, but instead, the actual lifespan of a character. Some characters, like Bugs Bunny, Mickey Mouse, Scooby Doo and the like, are designed to be in a perpetual "now", always existing in the time-frame of their current adventure. Most have an utter lack of continuity to give them the impression of growth, let alone aging. However, for fans of comic books, we are used to the progression of time, since the tales of our comic heroes are told in a manner of continual procession - one adventure linking to the next - with an illusion of growth and some actual aging. Spider-Man was a high-school student when he was first bitten, and had progressed to a late 20-something (early 30's? maybe) man (well, until the re-do button of the "One More Day" storyline turned the clock back, somewhat). Still, even with all the apparent growth and decades of published comic stories, most comic companies put forth a structure that all of the tales (in "canon") took place within a limited, truncated time-frame. 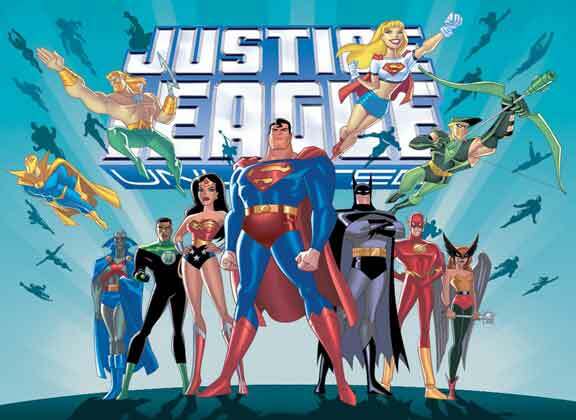 If they didn't, Superman and Batman, who were created in the late 1930's, and were portrayed as being in at least their 20's in those adventures, would be near 100 year old men. Still, beyond the limiting of the perceived lifetimes of our caped and cowled heroes, some characters don't even have to worry about their aging processes, as they are written to be ageless. Gods, demons and apparent perpetually long-lived mutants needn't be concerned. This is one area that readers of fantasy fiction know that the sorcerer is typically a part. Most sorcerers are, if not near eternal, then possessed of exceptional longevity. Be it by the concocting of potions, the obtaining of mystical talismans, or the slowing of time by some sacrificial rite, many magic-users see the passing of centuries, if not eons. 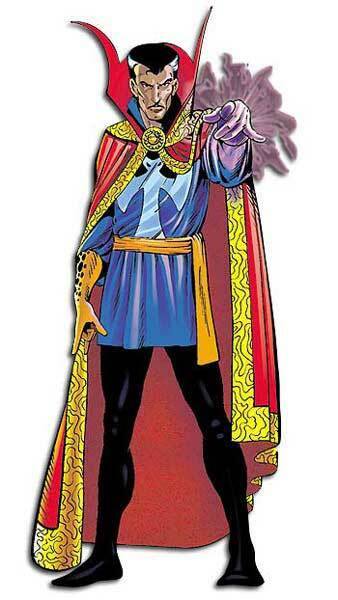 And so, we come to Doctor Strange; Marvel Comics' own Master of the Mystic Arts and (once and future) Sorcerer Supreme. Once a normal man, a physician, he would, after a car crash ruined the nerves in his hands, journey to the Himalayas, ostensibly to seek a cure, but ultimately to learn the way of the mystic arts. Tutored by an aged mentor known as "The Ancient One", Stephen Strange joined the ranks of the "Order of the Aged Ghengis". The Ancient One was well over 500 years old by the time he passed on (not by natural causes, by the way) to become one with all there is. The Aged Ghengis is far, far older than that. It is said that he was alive at the dawn of humanity. Doctor Strange, while born in 1930 (according to Marvel's own wiki, [although, I've long held a slightly different time-line wherein he was born in 1900, I'll post my timeline one day - for the curious]), was a mortal man for most of his life, well into his time as a mystic. It wouldn't be until he would undergo testing by his deceased master, that he would pass the trials that would grant him a kind of immortality. The test? Nothing too hard... just accept the inevitability of death itself as an option in all things and... to then die himself. "I died... but, I got better." Journeying through a realm of unreality, Strange is forced to learn that death is no illusion. But it is through this acceptance that he is able to face and then transcend death. Now, he will no longer be a mortal, in the sense that he will no longer age or feel the impairments of illness from within. He CAN still die - from forces from the outside - most likely from battle, but unless some outre effect causes a detrimental wound, Strange can expect to look and live exactly as he does now - forever. 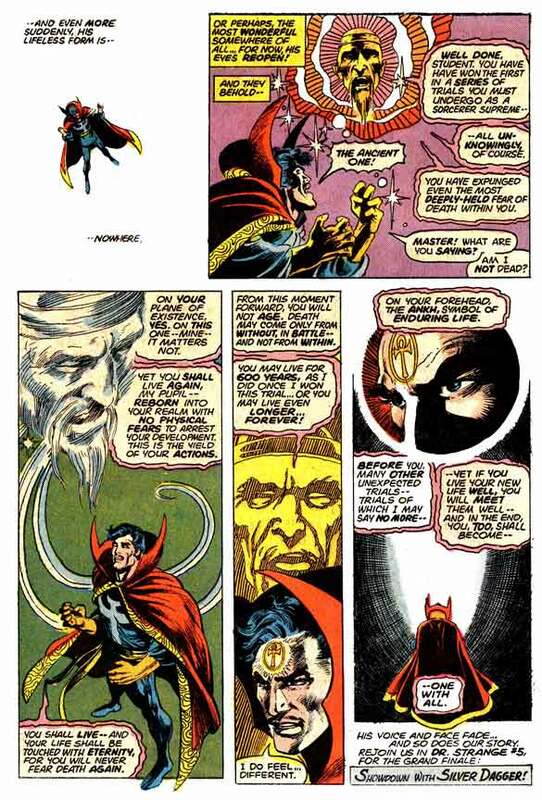 When Strange was anywhere near a death situation, the sign of the ankh used to flare upon his brow. 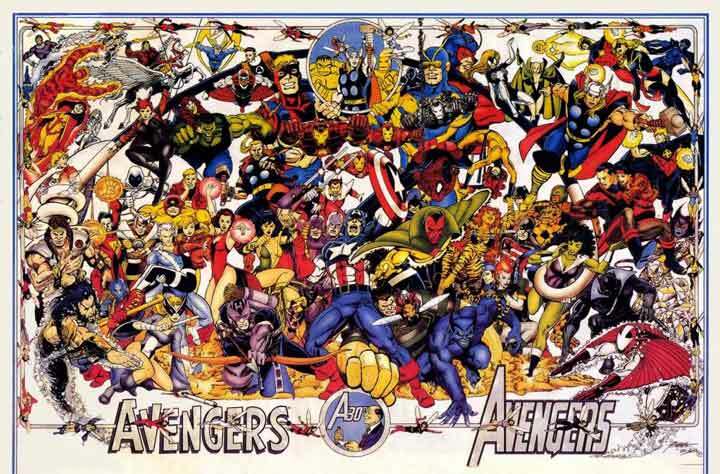 Such a visual spell has long since been stopped - probably long-forgotten by all of today's creators. Truthfully, it's probably for the best, since every time he was in a battle and was close to losing, the ankh would appear. Battles via sorcery tend to be life/death scenarios, and if you're not winning against a demon-sorcerer, there's a good chance he's going to kill you, so it became a tired trope pretty quickly. 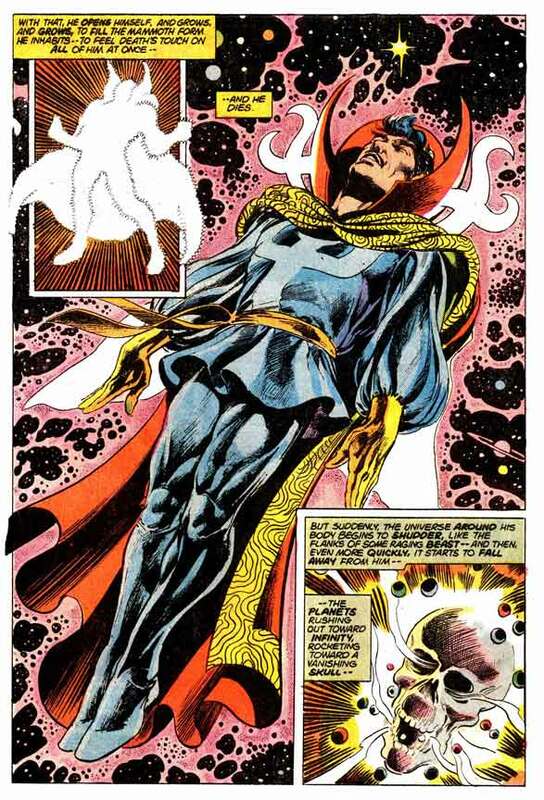 Over the past bunch of years, I have wondered as to whether or not writers even remembered the "immortal" aspect of Strange's nature. 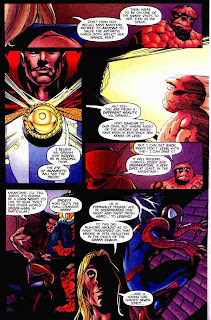 Especially since David Quinn's 1993-1995 era storyline (and issues 72 - 75 in particular) wherein Strange's body was severely damaged by the demon sorceress, Salome'. During this time, Strange's body was decaying (mystically) and was being eradicated - eaten away by her destructive magicks. Due to this, he takes to wearing a protective suit of magical armor. It isn't until after he tricks her into removing the tainted magics that he is reborn - younger and more powerful than before. However, that rebirth was a mere rejuvenation and not an actual replacement of a new body for an old one. So, it is to be believed that the old spell granted by the Ancient One is still in effect. 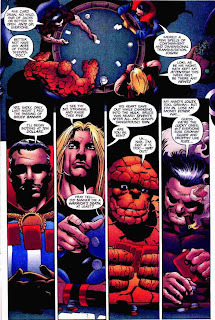 One story in particular points directly to the immortal nature of a few of Marvel's heroes. 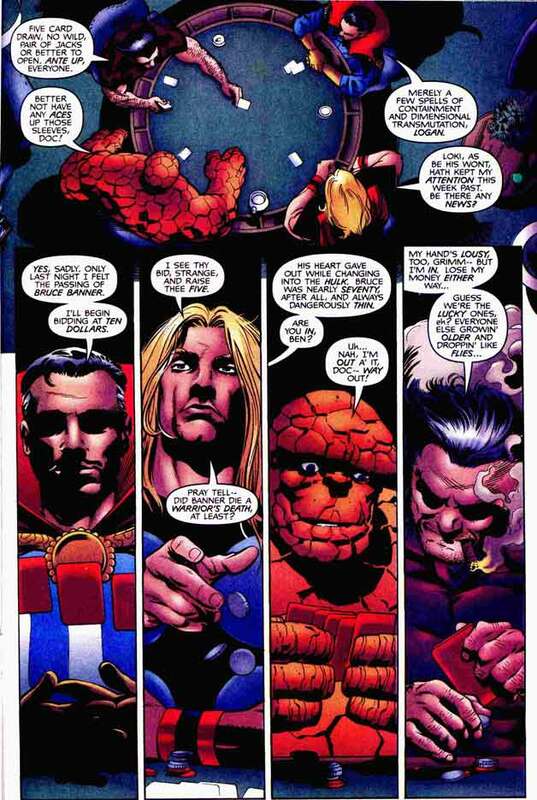 In a Fantastic Four Annual (1998) the Thing travels to an alternate Earth wherein the "10-year sliding scale" doesn't exist, and the FF began as a team in 1961. 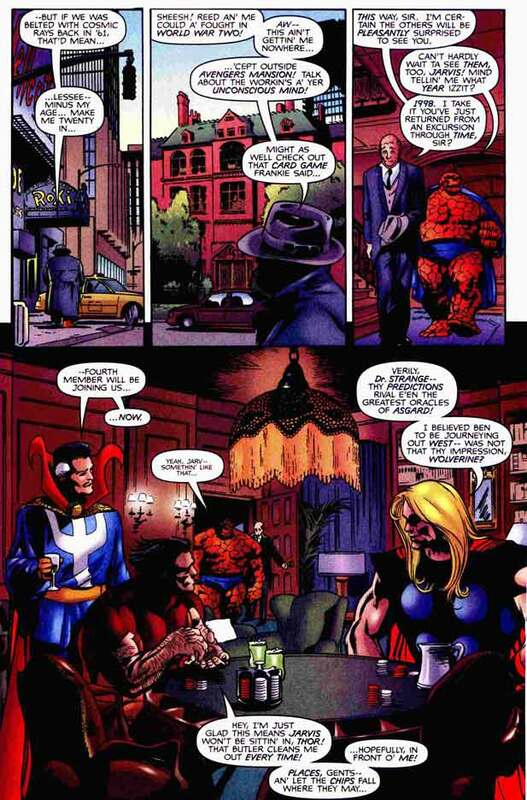 He goes to Avengers mansion to see some of that Earth's heroes and finds only a few of them exist - while most others have retired or passed away. 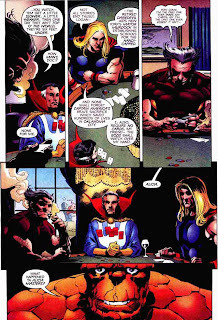 Doctor Strange, Thor and Wolverine are still among those active in the world "today", and they note the passing of several of their compatriots. 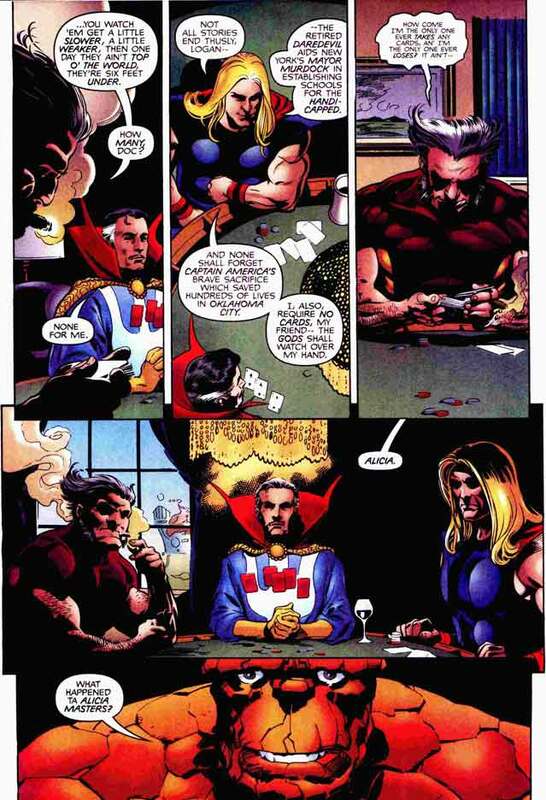 DOCTOR STRANGE, THOR & WOLVERINE - gossiping "old" hens. But other than that "What If?" 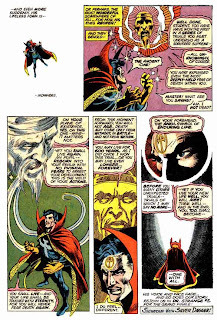 type of tale, Doctor Strange is still but one of a few actual "ageless" characters - and one of the few that they have granted a specific birth year. So, no matter the 10-year scale, Strange will always stand outside of his time. Hopefully... eternally. 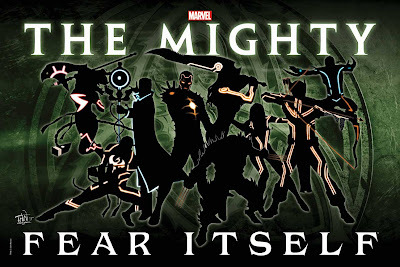 Well, MARVEL finally shone a spotlight on the previously silhouetted images of "THE MIGHTY" (as I last blogged about [HERE]). Here we see the "team" in their full regalia ready for the wrap up to the "FEAR ITSELF" storyline. With weaponry created by Tony Stark (with the aid of Asgardian weapon-smiths) and costume-detailing inspired by Disney's Tron, this is a hodge-podge of cool idea and not-quite-there-yet bit of design. 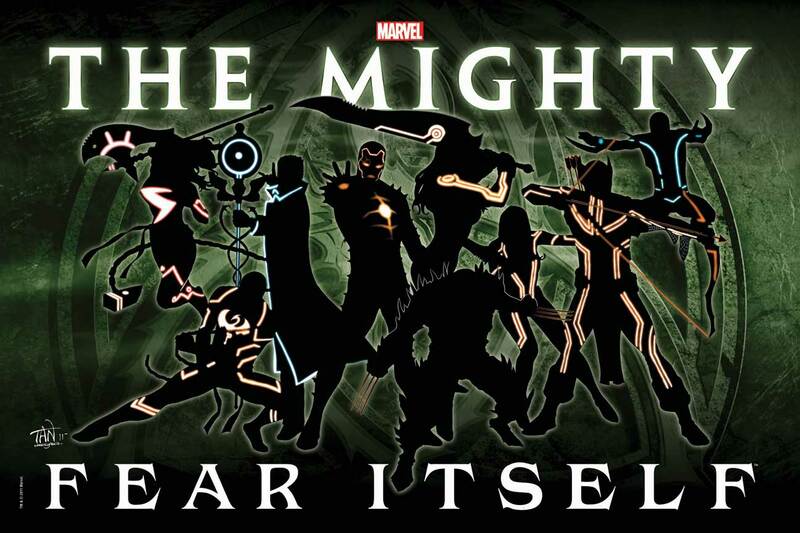 While this is pretty much exactly what I expected when I saw the original teaser image, I had hoped that Marvel would put forth more of a cool visual. Seriously, even the all-black with only glowing hightlights look of the TEASER is better than the final designs. 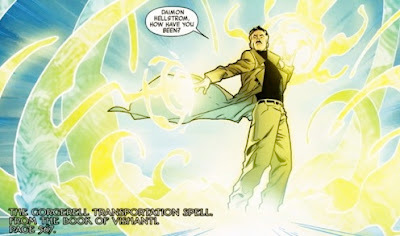 Oh, well... anything that utilizes Doctor Strange in a positive, mass-exposured, light is fine with me. BE a HERO to a CHILD. Several months ago, I had ordered a copy of a Super Hero Squad comic (a tie-in/ promo for the SHS ONLINE video game) in the hopes that DOCTOR STRANGE would be in it. Unfortunately, since I pre-order my comics 3 months in advance of their publication, I have no idea if what I'm buying is what I hope it is to be, and in this case, in order to obtain the item in question, I had to order a CASE of 25! Well, I figured, they were only 50cent cover price (and I usually get a decent discount - normally 40% off) so it was all good. If Doc WAS in it, I'd keep two and then give away or have a blog contest for the rest, or at the very least find some actual KIDS to whom I might give them. Sadly, no Doctor Strange was to be had in the issue (bummer), and so I now had 25 copies of this issue and wasn't quite sure what to do with them - yet. As some of my astute readers (and especially Twitter followers - seriously, I Tweet almost CONSTANTLY) will know that I have a new job wherein I work directly with children - and most especially, "Special Needs" children. As such, each child - like you or I, have their own unique perspective and areas of interest. Some kids' "needs" are on the surface while others lie hidden deep within. It's up to us to try to reach them on their plane of existence and slowly guide them over to - if not our own, then at least a middle-ground. So, I always like to try to find what makes the kids "open up". You wouldn't believe how often it's SUPER HEROES. Honestly, it's a gold mine. Normally, this subject is broached when the child either asks my name, or I offer it forth to inquire of theirs. When I say; "My name is Peter", they almost always say, "Like Peter Parker! Spider-Man!!!" To which I reply with any number of appropriate responses to show my familiarity with the character, and allude with hints at my deeper understanding of comic book lore. I don't overtly blab about comics, but I cast out a few obvious references, that if the child has any interest, they will take the bait and I can then reel them in with more active conversation. So, it came to pass when I was working with two such children, young boys of 9 years of age, each with their own differing "special needs". One of them needed to have constant interaction, lest he retreat into his own "head-space" which was when trouble would usually begin. The other child seemed almost always on-guard and didn't speak overmuch. While working with the more outgoing child, working on his letters and numbers, in a coloring / activity book, the subject of super heroes came up. He initiated this line of conversation, ostensibly via the realms of video games and cartoons. "So, who is your favorite super hero?" I asked. "Nightcrawler!" was his unexpected reply. "Really? He's MY favorite of the X-Men, too," said I, "I also really like Cyclops!" I asked him how he knew of Nightcrawler, and he went on about some video game (I missed the name of it, as he spoke so fast) but then I heard the unmistakable words, "...and the Super Hero Squad!" That cartoon seems to be seen by every little kid I come across. While I may not be a fan of the show, Marvel seems to have reached a new generation of kids via jokes of belching and flatulence in tights. So, I promised him that I would bring him some Super Hero stuff later that day. Still, as promised, I brought 2 of the aforementioned Super Hero Squad comics and just gambled that the other child would be interested. When I saw them several hours later, I went up to the 2nd boy first. "Do you like Super Heroes?" I asked. "Sure!" he responded, eyes alight. Perfect! I handed him one of the comics and gave one to the other child. 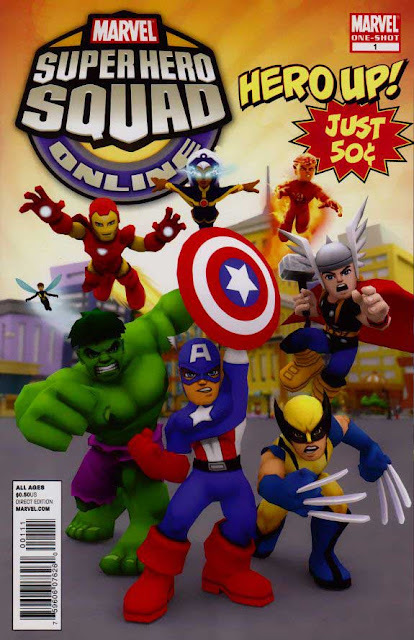 "SUPER HERO SQUAD!!!!" They both erupted with joyous howls of excitement! "Yes, these are for YOU. You can KEEP them." And thus the bouncing and rambunctious happiness continued. I made sure to let them both know that they had the same issue of the same comic, so as to avoid any rivalries or complications. I'd find out their individual likes and cater to those later, but first, equality reigned. The rest of my time was spent with the usually shut-off boy (the first boy was engrossed in the comic and his aide was helping him read it) and a usually guarded child became engaging and verbal - more-so than anyone present had seen before. Excited, extended conversation, with references to his interests and knowledge of the characters via cartoons and many, many super-hero video games, and his declaration that he has been at work on HIS OWN COMIC BOOK story for a class project, were all non-stop topics. I found that he had no one favorite character. 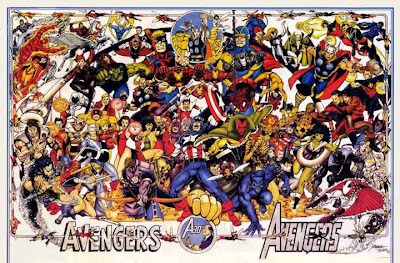 He liked Marvel and DC heroes fairly evenly (although he did like the Marvel ones a little bit more), and he would learn about new characters and like them in turn, until he learned of others and so on and so on. Not bad... intelligence gathering on as many characters as he could, while retaining the information of what he already learned. Growing his knowledge and appreciation as he went along. As the rest of our time went on, he brought up the MARVEL CIVIL WAR. "How do you know about that?" I inquired, hoping to hear that he read the comics. "I played the Ultimate Alliance II video game." was the 'What? You never heard of video games?' retort. "Oh. I only played the first one." I said truthfully, trying to regain some cred. He then discussed the "right / wrong", "good guy / bad guy" aspects of the battle between heroes. He began by saying; "So... Iron Man is a good guy and Captain America became a bad-guy for a while..."
I let him finish his thoughts and asked him why he thought Cap was being a "bad-guy". "He didn't register!" was the indignant reply. So, I then went into all the variables of what registering would entail; giving your secret identity, what your powers were and agreeing to have Iron Man tell you whether you could use them, or where you would live. Unsure, he inquired, "That's what registering means?" "Yup. In this case. They wanted to know everything and would then tell you what you would be able to do." Reasoning it out, he admitted, "Oh... in that case... maybe Iron Man isn't totally right." "Well, they were BOTH right. And they were BOTH wrong." I tried to explain. Each position had its merits and its problems, both heroes had valid points but they couldn't come to an agreement. I then explained how Iron Man wanted heroes to act as official helpers for police and the army working with the government, while Cap wanted to continue fighting for the people as a free agent and not being told what problems were worth his efforts. Making sure to let the boy know that the Police are there to HELP YOU and having heroes as official helpers would have been very good. I then told that Police are registered, as are people who want to vote. It has very good applications and merits. Just not in all things. I saw the wheels moving in the boys head and saw that he was now open to many differing angles of this discussion, where before he was adamantly in the belief that Cap was wrong. "If I was a super hero, I wouldn't want to tell them who I was or how I got my powers." he asserted. 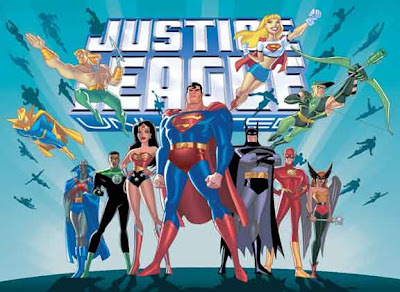 But through our discussions of comics and video games... cartoons and random ideas... he said to me, surprised at the concept and excited by its significance; "We have this stuff in common!" 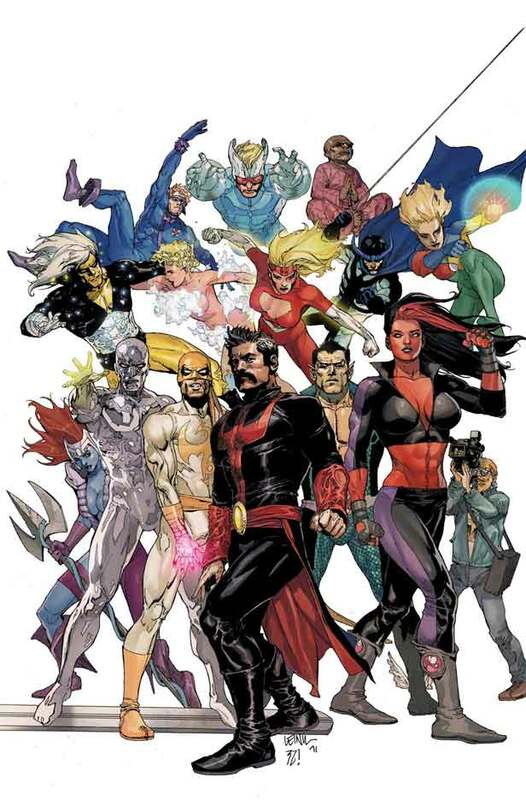 Personally, I had no official stance on the Marvel Civil War story, for I, too, saw both sides, and like Doctor Strange, would rather have stood aside as a neutral party, helping everyone on either side, to make peace. The whole point of my relating this tale is not to discuss the merits of the Civil War or even comic books in general. My point is that be they "special needs" or not, every child has thoughts and interests and often times feel as if adults are these people who just tell them what to do and have little in common with them - unless it suits the adult. All it might take is a little bit of inquiry, research and conversation into the child's deeply held interests and they will come alight - thrilled and amazed in the way that, even for a little while - child and adult - "have stuff in common". A DAY and AGE of HEROES! 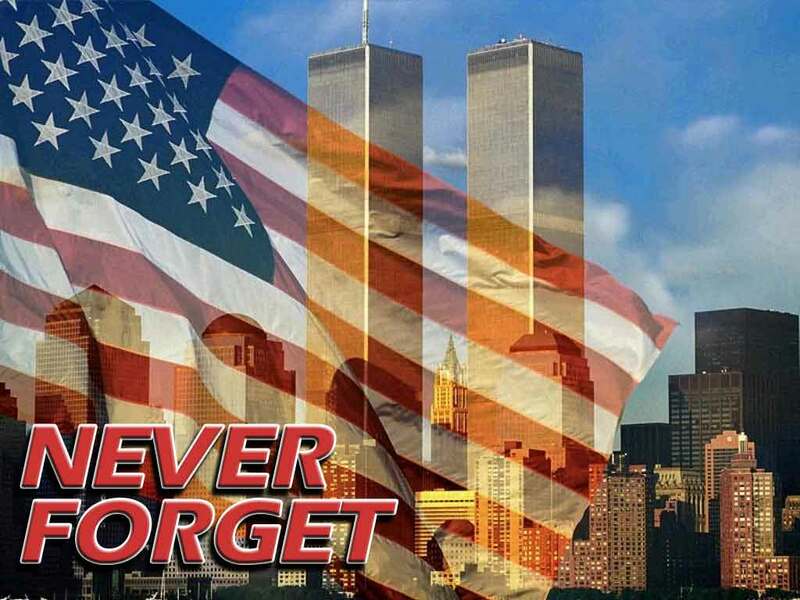 It's almost impossible to believe that it has been 10 years since the attacks on American soil on 9-11-2001. I can still remember the events as vividly, and as tragically as if they were happening before my eyes today. The scenes of unbelievable magnitude that unfolded - live... as it happened before millions of viewers - are etched forever in my mind. I was supposed to have a few job interviews lined up, but each had been rescheduled to a week or so later, so I was safely home in my then-apartment on Long Island, NY. Due to the utter chaos that was transpiring, many in the heart of NYC had no idea what to do or where to go. 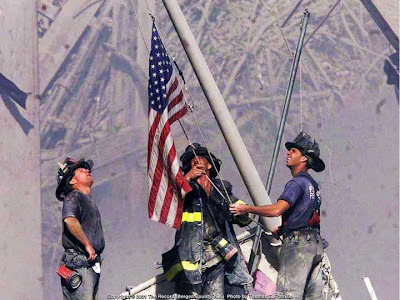 So, while I was frantically calling everyone I knew who was in New York City that day, and relaying information that was being given on the news to those with whom I could reach (of where to go, what areas were clear, etc..) there were others who were doing what THEY could... in the very heart of it all. First responders arrived from all across the New York, New Jersey, Pennsylvania area, and more kept coming from all over the country! ALL CAME FORWARD in this time of need! 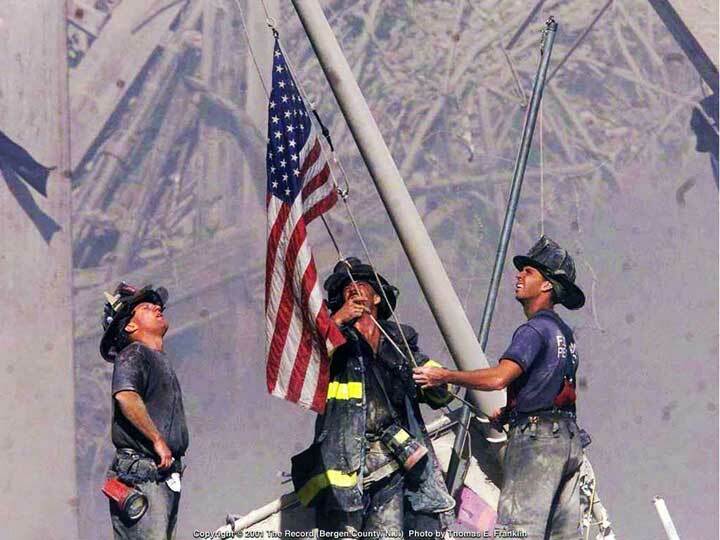 NEVER FORGET the REAL HEROES that walked among us that day. Follow my Mindless Synaptic Misfires. Due to my new job - which requires me to be up at 3AM and asleep by 9PM - much of my productivity for personal matters (blogging!) has been severely curtailed. This is because the job is of a "split-shift" and allows me time to rush home midday and maybe type a few words (like I am doing right now) before cramming a sammich down my gullet, checking in on the kitties and rushing back to work. While I am away from my keyboard, I still have stupid rambling thoughts, and for those of you who may think that my normal posts are overly long and verbose with blathering bloviation (ALL of you think that - admit it. I know!)... you'll appreciate that Twitter Tweets are regulated to a mere 140 characters per Tweet. So, even though I may not be blog posting each day, I Tweet on Twitter like... a Twit. The words of the U.S.S. Enterprise's Pavel Chekov (from; "Star Trek : The Wrath of Khan") are apt. That is because this song has been playing through my head, non-stop, since I first heard it a few days ago (after it aired as a part of Cartoon Network's Adult Swim special presentation of the season opener special for the VENTURE BROS). I just want to share my madness. After a mockumentary, 'The Venture Bros.: From The Ladle To The Grave—The Shallow Gravy Story', detailing the "rise and fall and rise and fall and rise" of the teen group; "SHALLOW GRAVY" (Hank Venture and Dermott Fictel - with robot H.E.L.P.eR as a Peter-Criss-make-up-wearing, walking-spider-eyed, drum-machine) we were treated to a music video for the single; JACKET. All I can say is that I've replayed the damned thing so many times, my ears are bleeding - but I can't stop myself. I'll embed the video here (FULLY NOTING that it is copyright ADULT SWIM). It can also be purchased via iTunes, but it's been so long since I downloaded from them, I don't know if I have an account any longer. So, I'm sticking with the Amazon link. There IS another reason I am hyping the song/video. Like most of the VENTURE BROS. productions, it does have appearances by Doctor Orpheus (the Venture-verse's answer to Doctor Strange). But, in this case, that is a very small reason - because he is only shown in non-speaking, cameo appearances, and also because.. I just simply LOVE the stupid song! Yellow Jacket, Strait Jacket, Smoking Jacket, Full Metal Jacket! Flack Jacket, Leather Jacket, Varsity Jacket, It's Brock's Jacket! Puffy Jacket, Bullet-Proof Jacket, Track Jacket, a Woolen Jacket! Dungaree Jacket, Jean Jacket, Denim Jacket, They're all the same jacket! You are my outer wear. My special coat, without a tear! With a hood, or a belt, or a sleeveless one. Doesn't count, that's a vest called a Jerkin. Fonzie's Jacket, Bolero Jacket, Tuxedo Jacket, An Eisenhower Jacket! Nehru Jacket, Satin Jacket, Riding Jacket, Technicolor Jacket! Welding Jacket, Child's Jacket, Driving Jacket, Reversible Jacket! 'Members Only' Jacket, Padded Jacket, Fringed Jacket, Double-Breasted Jacket! These are the coats we wear, of Devil's Plant, and Witches Hair! You are my outerwear. My special coat, without a tear! HE STRIKES FROM THE CIRCULAR FILE! 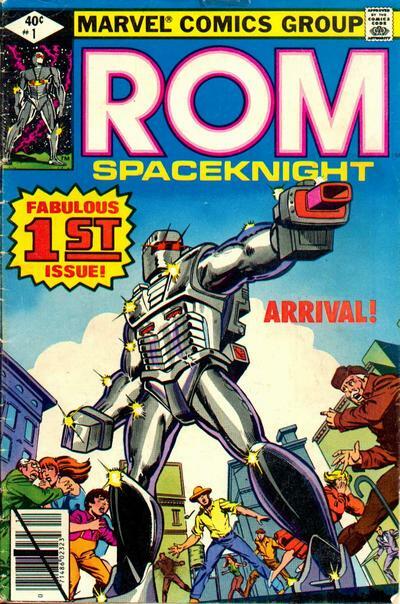 As one of the "FOUNDING FATHERS : BLOG TRINITY" of my love of comics and thus, a raison d'etre for this blog, ROM SPACEKNIGHT is a character and/or title that will always garner my attention. Licensed by Marvel from Hasbro for a giant electronic figure that the toy company wished to mass market, ROM : SPACEKNIGHT became one of the best-ever licensed properties - especially for that of a toy. (For the full information on the toy - including a video showing how it worked - check out this old post [HERE] and its follow-up post [HERE]). A series, written by Bill Mantlo and drawn by Sal Buscema (and later, Steve Ditko) the title has garnered fans the world over, and to this day is beloved part of my youth, memories and collection. 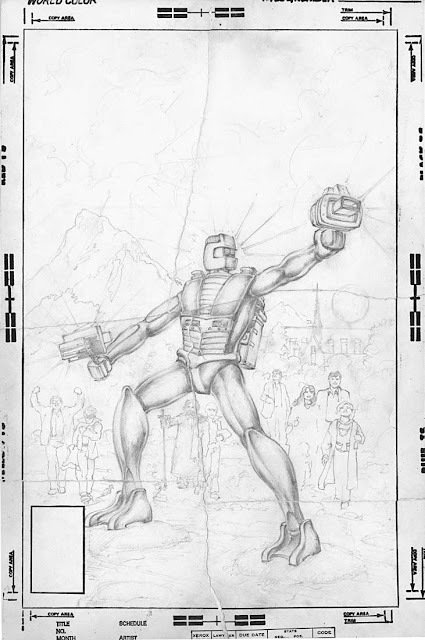 So, when it was shown - on the blog of Marvel Comics' former Editor-In-Chief; Jim Shooter [HERE] - the previously UNPUBLISHED FIRST DRAFT of the COVER to Issue # 1... well... I just HAD to showcase it here as well! The artwork shown here is torn into pieces by the artist. This is due to, having his cover being rejected (due to its being totally misrepresentative of the story within), Netzer tore the artwork and stormed out of the Marvel offices, vowing to never work there again. As the artist noted, his interpretation of the cover had the townsfolk "...admiring the magnificent robot..." which is the direct opposite of the "Day The Earth Stood Still" type of vibe that the creative team were looking to achieve. 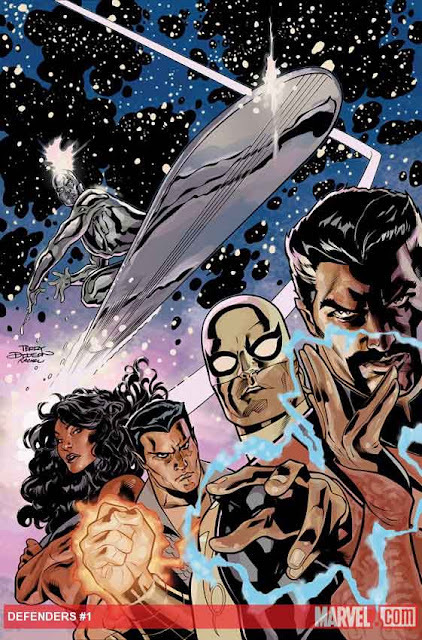 To make matters worse, Netzer also drew several Marvel staffers as beatific apostles, with himself as some Christlike figure in the bottom-center of the image. As the story goes, after being told to re-draw the image more to the editorial direction, Netzer instead tore up his artwork (as shown above), vowed to never work for Marvel again, and then proceeded to venture on a deranged mission to hijack a plane! Needless to say, this presented a HUGE problem, because the cover was already late and there simply wasn't time for another to be commissioned. 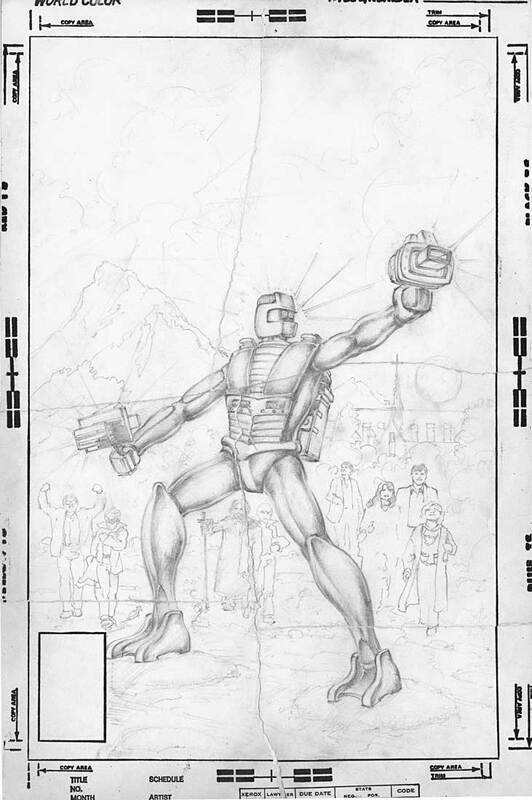 Enter new star artist Frank Miller, and overnight he whipped up the illustration that would be used to grace the cover of ROM ; SPACEKNIGHT # 1! Here, we present that FINAL, PUBLISHED image! While the story's mood is captured better here than in the unused piece, many similarities of ROM's pose can be seen between the two covers. Obviously, Netzer's cover was drawn using the actual TOY as reference, while Miller's seems to have used Netzer's as reference. The entire story of the bizarre debacle can be found on a previous entry of Jim Shooter's blog [HERE]. And, once again (because it IS a really good blog post) I'll drop the linkee to where you can read about how ROM is one of the three founders (with Man-Thing and Doctor Strange) of my love of comics. (And, again... For the full information on the toy - including a video showing how it worked - check out this old post [HERE] and its follow-up post [HERE]). Just wanted to touch base with a quick post to let everyone know that I have been without electric and/or (more importantly) internet for several days since Hurricane Irene, and as such, have missed opportunities to blog several items that I have had ready (or near ready) to go. However, in a mere few hours, one of those posts will go live. So, be ready. More will come soon thereafter.